I should have let you know about this when I signed up a couple of weeks ago! Foreigner Tickets - I am not sure if the sign-up window is closed yet. The last day is TOMORROW, 19 February! However, you can buy tickets at the door! It's on the third floor of Coex Exhibition Center in halls C and D1. Hall C has all of the tourist organizations' booths. And hall D1 has the food and marketplace items. I was actually surprised how many different cities/provinces in Korea have their own wine. It would definitely make a great unique gift for someone! Click the picture to enlarge the map! Basically province has a booth! The interesting thing to me, is that a lot of the -gun are represented, which are the small counties in Korea. It's smaller than a city. There are also booths where you can do "experiences" including learning traditional Korean drumming, trying on hanbok (Korean traditional clothing), do pottery, and painting and other arts and crafts. I really liked this artist's work at the Gwangju booth. 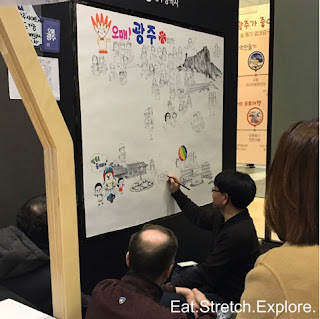 He was adding caricatures of the expo ascenders to the big poster with hand drawings of tourist points in Gwangju. You can walk around and get a ton of information and participate in a bunch of activities and get free swag! You can do some SNS activities and get some cool stuff! You'll notice that certain cities have HUGE tourism budgets...it's the likely culprits - Jeju, Busan, Gwangju, etc. I was kind of surprised how bit the Paju booth was. Also, I'm currently using a free Burger King calendar I got when I bought a Mango Jelly Bong Bong drink on the 1000 KRW menu, so I am kind of jazzed about the calendar.